"Charlottesville Downtown Mall" - Voted the best small town in the US for 2 years. 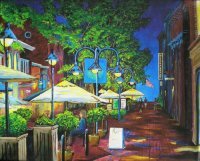 This print captures a modern angle on the vibrant, artsy nightlife of the Historic Downtown Mall. 22x26 Wrapped canvas on stretcher bars is ready to hang. Other sizes available. $125.00 plus $20.00 shipping. 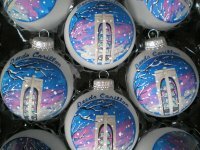 Dallas, TX Skyline hand painted on Christmas Ornaments for Corporate Appreciation Gifts - $45.00 plus $5.00 shipping Each. Order early or price not guaranteed. Taking Other City Request! Dayton, OH Historic Deeds Carillon Bell painted on Christmas Ornaments - $40.00 plus $5.00 shipping each.